This has been my mantra for several years now, and it has seen me try all manner of things, from rock-climbing and surfing to a barista course and learning the art of whisky making, to jumping out of planes and trying hip-hop yoga. I’ve found that trying new things to get out of your comfort zone helps keep your ego in check, strengthens your relationship with adversity, and above all, increases your appreciation of life. In retrospect, it’s not the comfortable times that we remember, the times we find ourselves sitting on the couch watching Netflix. No, we remember doing things that were marred by friction; we remember the uncomfortable — the long, painful hike, getting wiped out by a huge wave, or giving a talk in front of 500 people for the first time. Greatness is reserved for people who are comfortable with adversity, so the more comfortable you can get being uncomfortable, the more likely you will be to take the steps required towards said greatness. Starting the Future Squared podcast over three years ago was initially about getting out of my comfort zone (and marketing), but it has evolved into so much more, and has become a fantastic outlet to meet and learn from people from across all sorts of domains, such as technology, neuroscience, economics, and comedy. 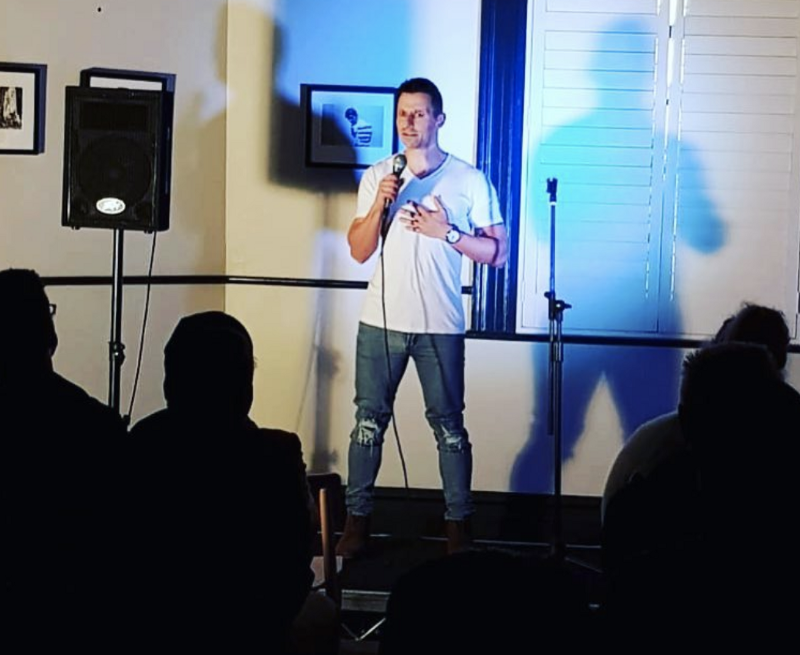 I had the pleasure of interviewing both Arj Barkerand Steve Hughes, two prominent names on the Australian comedy circuit, the former selling out Melbourne’s 1,000 seat Athenaeum Theatre throughout the Melbourne International Comedy Festival. Their stories, upon reflection, remind me of the entrepreneurial journey — marred by perseverance in the face of sweat, dust, and rejection. Given my growing appreciation for standup comedy, and the bottomless inspiration I found at my local comedy club, the Comic’s Lounge, and countless Netflix specials, I decided to give it a shot. At the very least, I might learn some new things, meet some new people, overcome that little voice in my head that was screaming “don’t do this — this is gonna hurt!”, and maybe, just maybe, get a laugh or two. I wasn’t looking to become a household name, let alone a recognizable face on the local open mic circuit. Mostly, I was just wanting to become a wee bit funnier so that I could incorporate some more humor into my podcast, keynote talks and my workshops. Initially, I turned to a standup comedy Masterclass, facilitated by the delightful Steve Martin, before devouring ‘Do You Talk Funny’, a book by David Nihil. Then, I felt ready to start writing my own material and make, not a running start, but a walking with both feet wobbling at the knees start, which I hoped would resonate enough with audiences to give me the confidence to keep going after the first, nerve-racking set. I got some laughs, lots of blank stares, and bombed big-time on one occasion with material that I thought was golden, but I took lots of learnings out of the experience about not only standup comedy, but life more broadly. After the experiment, I found myself on the road, delivering a workshop for a client in outback Queensland, where I used what I had learned to tell the following joke to open the day. My colleague asked me if I wanted to do a gig in Roma. It got everybody laughing, and set the tone for a fun day ahead. A little bit of humor can go a long way, to not only making what you do entertaining, but also memorable, and effective. Not done standup before? Try it… what’s the worst that could happen?